The highly popular Iron Man movies have also been making headliness in the world of luxury timepieces with the wristwatch choices for lead actor Robert Downey Jr.character, Tony Stark. 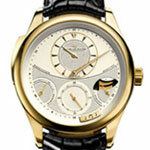 In the first movie, Iron Man 1, Downey's character can be seen wearing a rose gold Bvlgari Diagono Retrograde watch. Now, in the just released Iron Man 2 film Downey is sporting the Jaeger-LeCoultre Amvox 3 Tourbillon GMT watch. As far as I'm concerned a far more impressive timepiece that I think better compliments the characters lifestyle and unique abilities. Downey has also been photgraphed wearing the watch at press events leading up to the release. The Amvox 3 timepiece is crafted from ceramic and platinum 950 and has a case width of 44 millimeters and a thickness of 15.24. The dial and back of the watch are protected by a sapphire crystal case-back which helps assure the watches 50 meter water resistance. The platinum version has the reference number 193K450 and is a limited series of just 300 watches. The dial features a black meshed and openworked in its centre with white luminescent numerals, displaying hours, minutes, seconds by tourbillon, date, GMT and am/pm indicator. The Jaeger-LeCoultre Amvox 3 Tourbillon GMT Watch is powered by the calibre 988 single barrel automatic movement which beats at 28800 Vibrations per hour and contains 35 jewels. It also has a 48 hour power-reserve. The watch is completed by a perforated calfskin leather strap and a double folding buckle the measures 20.0 milimeters. The watch is also available with rose gold accents, as reference number 193C450. Jaeger-LeCoultre has introduced a special limited edition Master Compressor timepiece exclusively for their Beverly Hills boutique. As a tribute to their loyal west coast followers they went so far as to have members of the Jaeger-LeCoultre Beverly Hills Boutique Connoisseurs Club (JLCBHBC) involved in the watch's design. The Master Compressor Diving Alarm Navy SEALs Incursion sports all the great aspects of the regular model with a water resistance to 300 meters and a case back that optimizes alarm sound. But this model has the addition of the "Incursion" moniker as a tribute to the elite SEAL teams. Two versions of the Master Compressor Diving Alarm Navy SEALs Beverly Hills Boutique Incursion Edition will be available, an 18 carat black gold model and a dark grey PVD-coated titanium model. Both cases measure 44 millimeters in diameter with a unidirectional rotating bezel and calibrated scale. The black gold version will have burnt orange dial accents, strap stitching and compression key crowns - while the titanium version will have be yellow. The dial will be protected by a very special sapphire crystal which is adorned by a commemorative etching. The watch will be available with two straps - a leather and a dive strap in Cordura fabric. 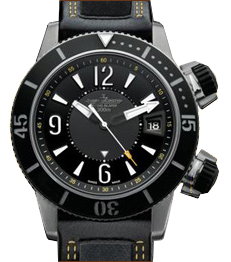 The Jaeger-LeCoultre Master Compressor Diving Alarm Navy SEALs Incursion Limited Edition watch is powered by the in-house JLC Caliber 956 which features a a 45-hour power reserve and a central winding rotor borne on ceramic ball bearings. The movement is made up of 268 parts, and measures 7.45 millimeters high. The gong has an enhanced volume and tonal clarity thanks to the design of the case back. The watches are to be accompanied by special thematic packaging that has yet to be revealed. 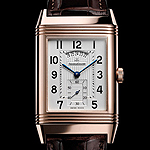 Jaeger-LeCoultre has introduced a new and impressive model to its Reverso collection, the Grande Reverso Duodate watch. The Reverso line was first produced as a reversible watch as a way to protect the timepieces worn by polo player’s, but it was originally had only a metal plate on the reverse side. 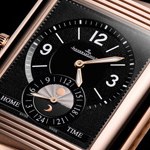 Jaeger-LeCoultre eventually came up with an idea of putting a watch face on both sides of the case. The Grand Reverso is powered by the hand-wound calibre 986 movement, which is produced in-house. The Grand Reverso will be available in two variations, a limited series of 500 will be produced in 18k pink gold and an additional 1,500 will be produced in stainless steel. The case measures 31.3mm wide by 52mm high, this larger case size is why Jaeger-LeCoultre classified it to be “grande”. 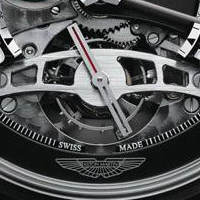 The main dial is silvered with a guilloche enraving with a seconds sub-dial and large date aperture. It has blued steel hands with Arabic numeral markers. The reverse face is black which allows for a second time zone and a synchronized 24-hour hand with a function of a day/night indicator. 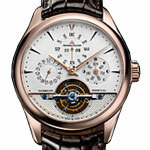 One year after its 175th anniversary Jaeger-LeCoultre has introdued a new line called the Master Grande Tradition. Two new watches are being introduced from this line, the Tourbillon à Quantième Perpétuel and the à Répétition Minutes. Each watch contains a brand new movement the Jaeger-LeCoultre Calibre 987 and the Jaeger-LeCoultre Calibre 947R both created just this year. The à Répétition Minutes is limited to just 100 pieces in yellow gold, while the Tourbillon à Quantième Perpétuel is available in 18 carat pink gold and platinum as well as a limited production of 300 pieces in 18 carat yellow gold. Tourbillon à Quantième Perpétuel has a 42mm case and features an beautiful dial that combines two different textures to acheive an intricate look. The perpetual calendar complication has displays for date, day of the week, moon phases, months, and the year and century in a digital format. The Calibre 987 movement is self-winding and was entirely designed and manufactured by the Jaeger-LeCoultre team of watchmakers and is comprised of 401 hand finished components. The tourbillon alone has 78 individual components and weighs just over 0.28 grams. The balance frequency is 28,800 alternations per hour. The watch has a power reserve of 48 hours and is has been tested for 1000 hours and water-resistant to 5 ATM. The Master Grande Tradition à Répétition Minutes uses the latest breakthroughs in the field of sound with its square-section gongs made from an Jeager-LeCoultre exclusive top secret With the aim of enhancing sound transmission, the gongs are crafted all from one piece with their heel, affixed directly to the watch glass. The silicon escapement is visible through a magnifying glass integrated into the sapphire crystal case-back. The watch features the new manually-wound Jaeger-LeCoultre Calibre 947R movement which includes a minute repeater, barrel torque and small seconds. The movement is comprised of 430 parts and is 9.60 mm thick. The movement also has an impressive 14-day power reserve. In the world of fine watches it is definitely the year of the all black design. Jaeger-LeCoultre is no exception introducing the AMVOX3 Tourbillon GMT, a nearly all black design crafted from ceramics. The AMVOX3 is the latest watch born from the partnership between Jaeger and Aston Martin, a famed English manufacturer of luxury performance cars. This partnership began in 2005 with the Amvox I produced in both stainless steel and titanium and continued in 2006 with the creation of the AMVOX 2 produced in Platinum, PVD and Titanium. Jaeger-LeCoultre has crafted the AMVOX 3 from high-tech ceramics which is the first time this material has been used by the company. Using ceramic is a natural step for Jaeger as it is becoming a more an more popular material among luxury watch makers because of its many benefits. It has superior scratch-resistance and is a very hard yet light weight material, a little heavier than titanium but much lighter than steel. The AMVOX3 uses the mechanical automatic Jaeger-LeCoultre Calibre 988 movement which is hand-crafted and decorated. It is comprised of 323 parts and has 35 jewels. The automatic tourbillon has a carriage made in grade 5 titanium, beveled, hand-drawn and polished, with a ruthenium treatment. It has an upper tourbillon bridge in 4N gilded metal aluminum, and an automobile design AM/PM indicator bridge in black eloxed aluminium. 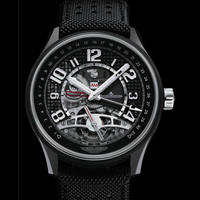 The black dial features a grid work motif inspired by automobile air inlets and has black luminescent numerals. The dial displays hours, minutes and a 2nd time zone as well as an AM/PM indicator linked to reference time, a tourbillon with seconds indication and a calendar with jumping hand. The watch is water resistant to 50 meters and is limited to 300 pieces.